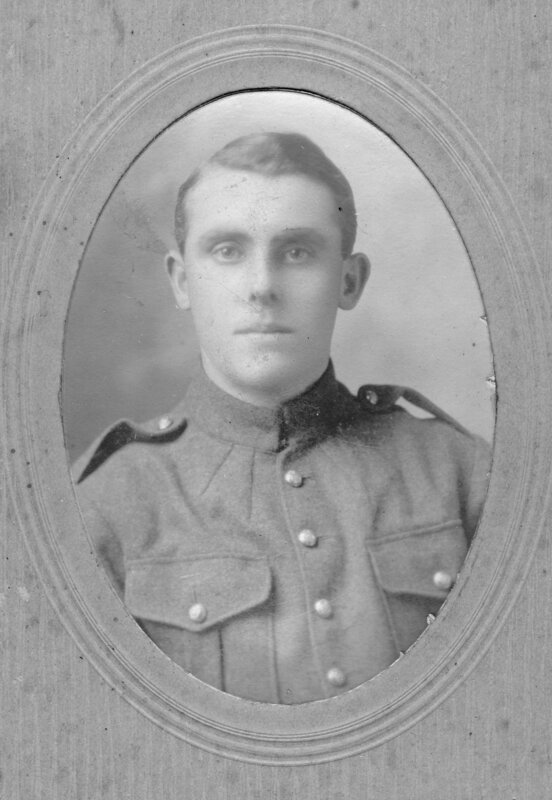 Hugh Wright from Hopewell (Shepody) enlisted in the 26th Battalion on November 17, 1914 at the age of 19 years. After training in Saint John for 8 months, the 26th Battalion sailed to England on board the ship “Caledonia” on June 13, 1915. After 9 days crossing the Atlantic, they arrived in Devonport. At the Sandling Training Camp in Kent, England, the soldiers continued rigorous training until they sailed for France on September 13, 1915. The soldiers of the 26th Battalion bravely took their place on the battlefront, showing gallantry and determination, which earned the battalion the proud name, “The Fighting 26th”. Hugh served in the 26th Battalion, 5th Infantry Brigade in Belgium and France and spent 17 months in the trenches. In February 1917, he transferred to the 4th Siege Battery of the Canadian Artillery and was a gunner for the remainder of the war. He received his discharge on May 19, 1919... on his 24th birthday! Hugh returned home to the Wright family farm in Shepody and in later years he was the light keeper on Grindstone Island from 1936 – 1950. Hugh was the youngest son of James and Annie (Smith) Wright. His WWI letters were always addressed “Dear Father” because his mother had died when he was 7 years old. I feel fortunate to be able to share the treasured letter written 100 years ago by my great uncle, Hugh Wright on November 11, 1918, the historic day when World War I was over. Just a few lines today to let you know that we are both well and that the war is at last over, so you will not need to worry anymore. The armistice was signed early this morning and everyone thinks it will last for good. The hostilities ceased at 11 o'clock this am. Father you have no idea how happy I am and I think I have reason to be. I can hardly realize that it is true, but it is and just think that we will be home in a few months. Well, Father I can't write much today. I received a box from home a few days ago with some maple syrup and it sure was good. Well, will close with Love to all.